The State of the UK Barn Owl population 2018 report is now available. 37 groups in the UK contributed breeding data to the report prepared by the Barn Owl Trust. Overall, 2018 was a poor year for Barn Owls but Shropshire bucked the trend with a high number of breeding pairs. We are encouraged to see that a barn owl has been recorded at the second nestbox installed earlier last year at a Shifnal site - see below. Although there was some regular barn owl activity at this site they appeared to be constantly thwarted in their breeding attempts by stock doves. 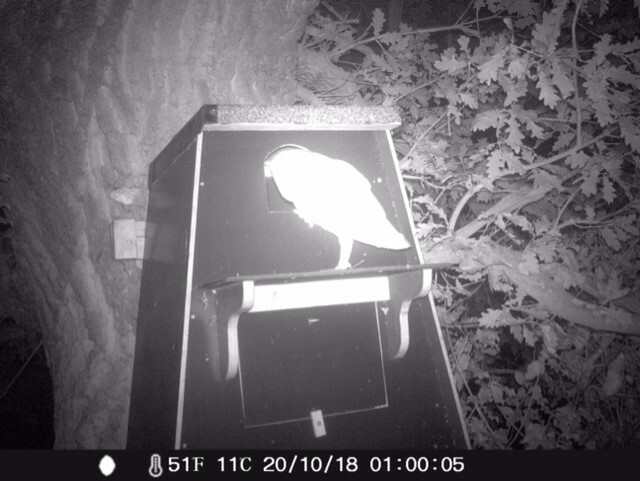 So, we opted to install a second tree nestbox close by and the enthusiastic landowners, keeping a regular look out for barn owls, managed to obtain the night-camera images of a barn owl using the nestbox. 2019 may well see a new breeding pair established at this site!! The Shropshire Barn Owl Group has been experimenting with a roosting box designed by John Lightfoot. The box utilises an old plastic drum with a entrance hole cut out in the front and an open base to discourage jackdaws and stock doves from using it as a nest site. Designed to be cheap and cheerful and quick to install the idea is that it will provide a safe and warm roost site for a member of a pair occupying a nearby nestbox. Roosting barn owls can be observed perched inside the box from a distance without disturbing them and white splash markings on the ground or tree trunk will allow us to determine if the box is in use. 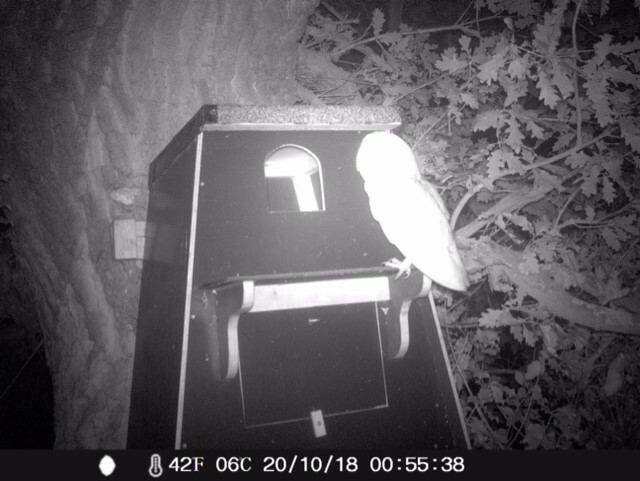 We have installed three so far and one has already been occupied by a roosting barn owl. The plan is to install a roost box whenever we install a new nestbox and to monitor their use. Another internal T-chest recently installed in a Dutch barn near the Severn Gorge, Ironbridge. Sightings of a barn owl in the vicinity and a probable roost cavity in a old ash tree prompted the installation of the nestbox. We await with interest for any signs of activity around the barn. Two more nestboxes recently installed to add to the 414 already installed across Shropshire - a tree box near Shifnal and an internal tea-chest in a delightful old barn near Much Wenlock. Stock doves have repeatedly occupied a tree nestbox at the Shifnal site, preventing access by the resident barn owl, site so we opted to erect another box close by to provide an alternative breeding site for the barn owl, reducing competition. The barn has been regularly occupied by a roosting barn owl and the presence of a substantial quantity of pellets suggests that the bird is feeding well over some good rough grassland adjacent to the barn. The signs for creating a new pair are looking good. SBOG recorded four cases of barn owls drowned in farmland water troughs in 2017, highlighting the problems that they face when attempting to bathe. The first report was from Selattyn where a juvenile, ringed on the 18 June in a SBOG nestbox, was recorded drowned in a trough just 42 days later and only 400 yards away on the 19 July. The second and third owls were found in the same trough at Alkington on the 2nd September and the 19 October respectively. The land owner has now drained the trough. A fourth bird was discovered in a trough by new landowners on moving on to the property and appeared to have been there for a while. 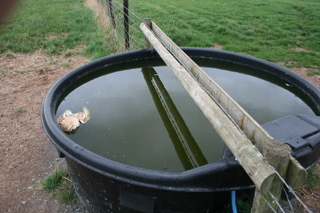 The indications are that less experienced young barn owls dispersing from their natal site are more susceptible to drowning in water troughs. This cause of death is preventable by taking simple measures to install a wooden float in the trough without obstructing livestock. If the trough is no longer required, then drain it. Further details are available on the Barn Owl Trust’s website at www.barnowltrust.org.uk. Early indications are that the 2017 breeding season will prove to be successful with good numbers of young barn owl produced. There may also be some second broods. A good breeding season following on from a successful season in the previous year appears to be an increasingly evident but irregular trend. Several new pairs have already been identified which are most welcome additions to the barn owl population in Shropshire. Our 2015 Annual Report is now available in the Annual Reports section. Monitoring of nestboxes and natural sites is ongoing and early results suggest that, as expected, 2015 will not prove to be such an active breeding season as last year. 2014 was a peak breeding season in terms of the number of young produced and the second best since monitoring began in 2002. In accordance with the cyclical nature of barn owl breeding in Shropshire 2015 is expected to show a dip following a peak in 2014. Barn owls appear to breeding sporadically, with some early nesters and some breeding later, while other pairs have failed to breed. Encouragingly, new pairs continue to be established which builds on the new pairs created in earlier years and is a positive step on their road to recovery in Shropshire. Our 2014 Annual Report is now available for viewing in the Annual Reports section. A young female Barn owl, possibly from a second brood of a known breeding pair of Barn Owls on the Shropshire/Staffordshire border was noticed frantically quartering a field on the 7th of October 2014 about 200 yards from a known nest site. Two days later the barn owl was found on a track bordering the same field, it was very weak and could not stand unassisted, so it was taken to the Cuan Wildlife Centre in Much Wenlock. It was here that her journey back to health would begin. The owlet went through a gradual reintroduction to food. Initially being tube fed then hand fed. She was also treated with a Vit. D supplement. By the 19th October she was taking food for herself and was putting on weight. After some time in an outdoor aviary and a test flight at Cuan she was passed fit for the next phase of her rehabilitation back into the wild. On the 6th of November, John and Wendy from the Shropshire Barn Owl Group positioned the mobile aviary about 15 feet from the known nest site in her original territory and the owl was brought from Cuan. Two dead day old chicks were placed in the feed box and the Barn owl was placed in the nest box contained in the aviary. The aviary was monitored from a distance and just over 2 hours later the owl was seen sitting on a perch in the aviary. Initially feeding took the form of three dead chicks being placed in the feed box each day at about the same time as she would have been fed at Cuan. Over a period of time mice were introduced into her diet to try and replicate the food source she would be hunting in the wild (she still had three food items per day, a mixture of mice and chicks). To try and reduce the level of human contact she was exposed to, the feed time was gradually moved to earlier in the day, when she was likely to be in her nest box and not in the aviary. This minimised the chances of her seeing anyone. The hope was that she would adapt to a more natural feeding time, taking her lead from the sounds of the other owls and wildlife in her surrounding area. She took to all this, and on the 19th of November a period of dry weather was noted in the long term forecast for the area. Food was placed in the box as normal and the lid of the aviary was raised at 3.30pm. The aviary was watched until 4.45pm by which time it was starting to grow dark and there had been no sighting of her. The next morning the feed box was checked and found to be empty and she had taken her leave. Food continued to be placed in the box for a further week in case she needed to supplement her diet, but none was taken. Our Thanks are extended to the Cuan Wildlife Centre and John and Wendy of the Shropshire Barn Owl group for all the help and assistance in the rehabilitation process of this owl. The mobile aviary has been proven to be invaluable on this first and very successful outing. SBOG is extremely grateful to the trustees of The Jean Jackson Charitable Trust whose generous award enabled us to fund the mobile aviary project. We would also like to thank P J Evans Agricultural Engineers, West Felton, Oswestry Tel. 01691 610377 who did us a good deal on the purchase of a quad bike which greatly assisted the siting of the aviary. SBOG is frequently called upon to assist with the rehabilitation of Barn Owls that have previously been rescued, for example by Cuan House animal hospital in Much Wenlock, which does a tremendous job in taking in injured and rescued birds and other wildlife. 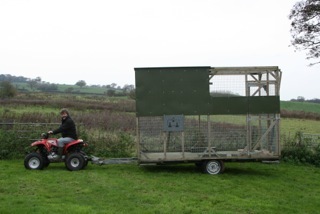 With this in mind we constructed (that is, John Lightfoot constructed) a mobile release aviary this year following guidelines laid down by the Barn Owl Trust. Adult barn owls are taken back to their home range and released whilst owls rescued as young birds and that have never been independent can be taken to any area of suitable habitat. The release process is a gradual one and involves towing the aviary to a site supporting suitable habitat and feeding the owl in the aviary for at least two weeks. Food is placed in the lower food box and water in a bowl on the floor. The owl is then placed inside the roosting box above the food box. The sheet metal sides prevent cats from climbing the aviary and stealing the owl’s food. This gradual process allows the bird to develop a feeding pattern and to become accustomed to its surroundings. Once the bird appears to be suitably nourished and ready to go the roof is opened on a fine day at dusk and locked into position. Feeding continues until the owl stops returning to the aviary for food. At this point we have to assume that the bird is hunting successfully and the aviary can be withdrawn from the site. In constructing the aviary we didn’t get much change out of £800 and feeding the owls will be a big commitment. But we think it is worth it and it really will give rescued wild barn owls the best opportunity of being successfully rehabilitated and returning to the wild to create another much needed and viable breeding pair. In partnership with the Shropshire Wildlife Trust and Veolia the Shropshire Barn Owl Group installed two pole nestboxes at New Works,Telford. The site and surrounding areas supported some good barn owl hunting habitat - permanent tussocky grassland - but provided no natural opportunties for barn owls to breed. The only option was therefore to resort to barn owl nestboxes on poles. Over 20 dedicated volunteers worked hard on a bright, sunny, winters day to get the poles to the location, dig the holes for the large telegrpah poles kindly donated by Veolia, install them and fix the pole boxes. The pole boxes were constructed by the Shropshire Barn Owl Group to a recommended design and were kindly funded by the SWT. There are no records of barn owl breeding in the immediate area of the site so we hope that a new pair will in due course become firmly established.